Brown burn scars pock the landscape across Portugal and Spain. Hot, dry conditions sparked dozens of devastating wildfires in Southern and Central Portugal and Central Spain in the summer of 2003. By the time this image was taken on January 19, 2004, the scars had begun to fade in areas, though the scars in Central Portugal and across the border in Spain are still dark red in the false-color image. 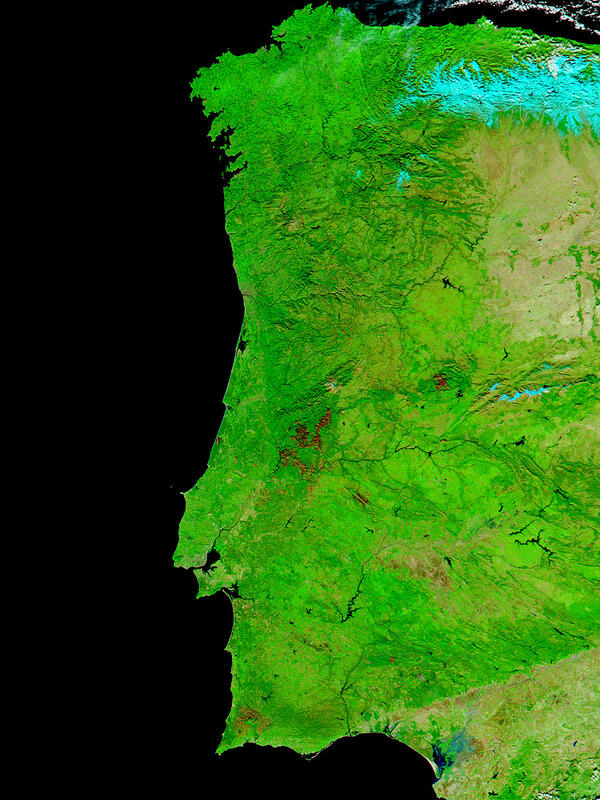 In the true color image, Portugal’s capital is clearly visible as a grey region surrounding the mouth of the Tejo (Tagus) River about one-third of the way up the coast. The Moderate Resolution Imaging Spectroradiometer (MODIS) on the Aqua satellite acquired both false and true-color images on January 19, 2004.